STEPANAKERT—Artsakh (Nagorno-Karabakh) Republic President Bako Sahakian on March 20 received federal and regional parliamentarians of Belgium, representing various factions in the state. 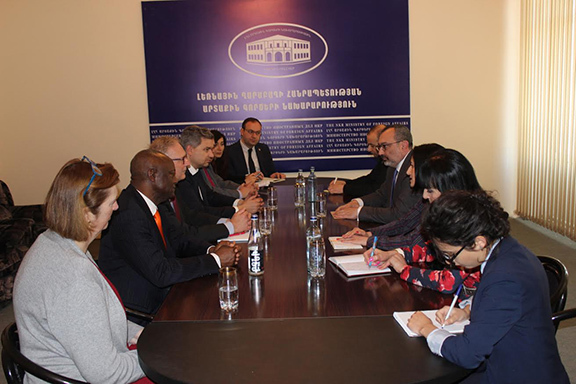 The visit of parliamentarians André du Bus de Warnaffe, Emmanuel De Bock, and Pierre Compagnie was the initiative of the European Armenian Federation for Justice and Democracy (Armenian National Committee of Europe). Issues related to the Artsakh-Belgium relations were discussed. Special attention was paid to the issues of parliamentary cooperation and development of relations between regions of the two countries. Sahakian noted that there were favorable conditions and sincere interest for deepening bilateral relations. Artsakh Foreign Minister Karen Mirzoyan, presidential spokesperson David Babayan, and other government officials were also present at the meeting. Mirzoyan met with the Belgian delegation separately, where he presented the priorities of the foreign policy of Artsakh, the current stage of the Azerbaijani-Karabakh peace process and the steps taken by Artsakh authorities towards ensuring conditions for the resumption of negotiations. Both parties stressed the necessity to settle the Azerbaijani-Karabakh conflict exclusively by peaceful means. 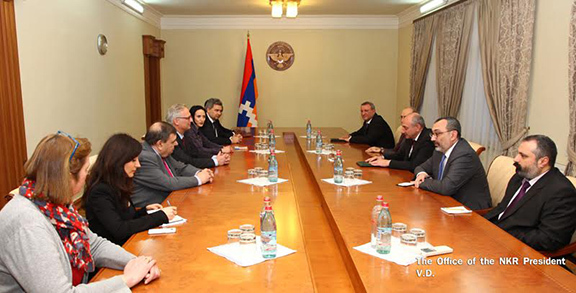 The parties also exchanged views on the state-building process taking place in Artsakh. The Belgian parliamentarians welcomed the consistent efforts of Artsakh authorities, aimed at strengthening and developing democratic institutions. They also underlined the importance of such visits for the further development and expansion of cooperation between Artsakh Republic and Belgium. Warnaffe, De Bock, and Compagnie on Monday also visited the Stepanakert Memorial and placed flowers in memory of the Armenians that became martyrs in the Karabakh War. Artsakh National Assembly President Ashot Ghulyan also received Warnaffe, De Bock, and Compagnie on Monday, and expressed hope that similar talks with Belgian parliamentarians will create major foundations for the institutionalization of relations, reported News.am. Warnaffe during the meeting congratulated Ghulyan on the results of the February 20 constitutional referendum, and stressed that the Karabakh conflict is becoming more important for them. In turn, Pierre Compagnie, who is in Artsakh for the first time, presented his respective impressions. “I see here a country whose objective is not to separate at any cost, but to correct the historical mistake; this is a great lesson for me,” he noted. Ghulyan then presented the main features of the new Constitution of Artsakh and answered questions. The Belgian parliamentarians later met with members of the National Assembly’s Artsakh Republic-European Parliament Friendship Group.